The oil sands of Alberta, Canada, are of international interest due to the potential environmental impacts, from local to global scales, of their extraction and processing to provide non-conventional fossil fuels to consumers in North America and globally. The governments of Canada and the province of Alberta launched the Joint Oil Sands Monitoring (JOSM) program in 2012 to help address knowledge gaps regarding long-term cumulative effects of oil sands' development and production. JOSM is a regionally focused program; however, the knowledge gained is applicable to extra heavy oil production elsewhere, given the large known global reserves of heavy oil and bitumen. 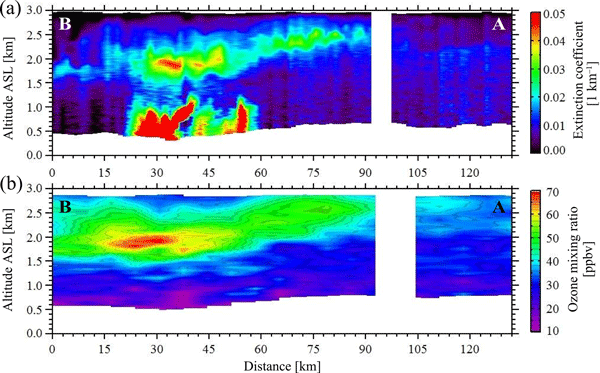 The purpose of this special issue is to bring together the scientific results of atmospheric-related JOSM studies, which have been largely conducted since 2013, although some of the potential papers could involve data obtained in earlier years. Other submissions within this scope could also be considered. The results would be derived from measurements from the ground as well as aircraft and satellite overpasses. Applications and evaluations of high-resolution modeling will also be part of this research portfolio. While the studies are to be focused on emissions and ambient levels, as well as deposition, with regard to the oil sands region in Alberta, and therefore referring particularly to conditions in that area, results will have a broader relevance scientifically. 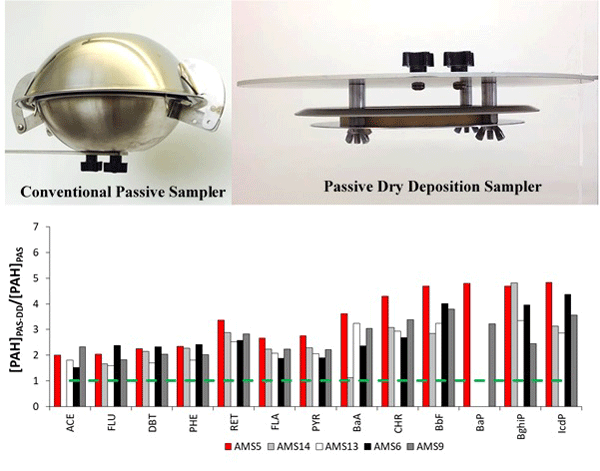 This ranges from evaluation of new satellite retrievals, new trace gas and aerosol measurement methods and techniques for source apportionment and emission inventory evaluation, to process studies of deposition, secondary air pollutant formation (gas and particle) and black carbon coating and light absorption. This work provides the first direct field evidence that anthropogenic organo-nitrate contributed up to half of secondary organic aerosol (SOA) mass that was freshly produced within the emission plumes of oil sands facilities in Alberta, Canada. The finding illustrates the central role of organo-nitrate in SOA production from the oil and gas industry, with relevance for other urban and industrial regions with significant intermediate-volatility organic compounds (IVOCs) and NOx emissions. Measurements of air pollutants at a ground site near Fort McKay in the Athabasca oil sands region in the summer of 2013 are presented. A large number of intermediate-volatility organic compounds (IVOCs) were observed; these molecules were shown previously to generate atmospheric particles downwind of the region. 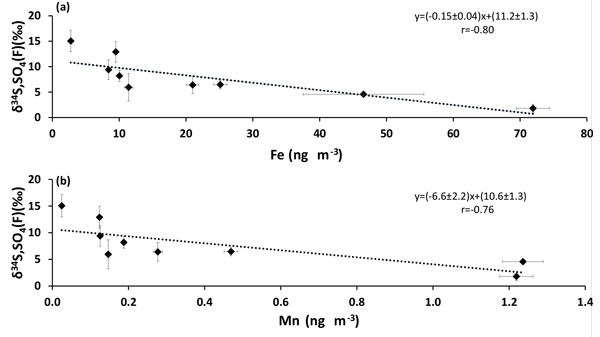 A principal component analysis was performed to identify major pollution source types, including which source(s) is(are) associated with IVOC emissions (e.g., freshly mined bitumen). This work uses aircraft-based measurements of smokestack plumes carried out in northern Alberta in 2013. These measurements are used to test equations used to predict how high in the air smokestack plumes rise. It is important to predict plume rise height accurately as it tells us how far downwind pollutants are carried and what air quality can be expected at the surface. We found that the equations that are typically used significantly underestimate the plume rise at this location. It is shown that using measurement-derived volatile organic compound (VOC) and organic aerosol (OA) emissions in the GEM-MACH air quality model provides better overall predictions compared to using bottom-up emission inventories. This work was done to better constrain the fugitive organic emissions from the Athabasca oil sands region, which are a challenge to estimate with bottom-up emission approaches. 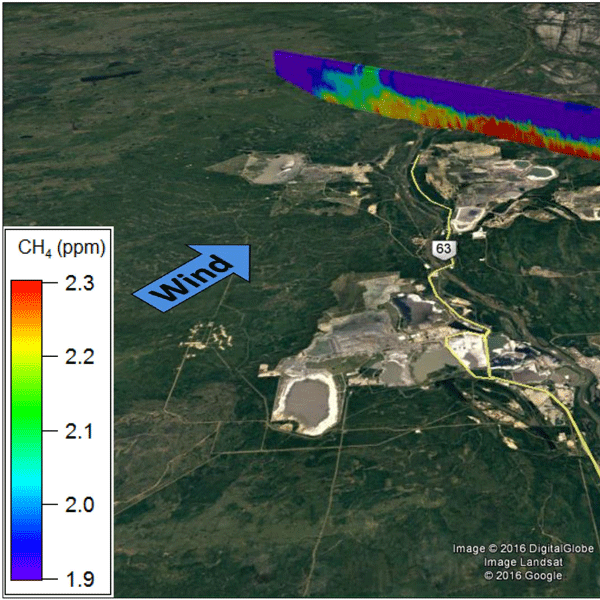 We use observations from the 2013 Joint Oil Sands Monitoring study. 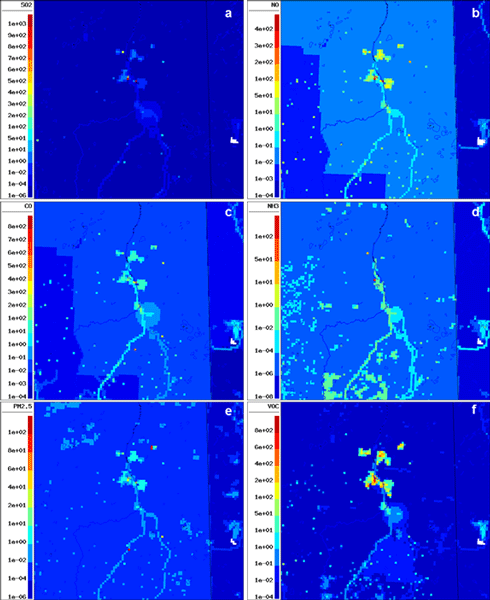 This paper discusses the development of new synthesized emissions inventories and the generation of air quality model-ready emissions files for the Athabasca Oil Sands Region of Alberta, Canada, using multiple emissions inventories, continuous emissions monitoring data, and inferred emission rates based on aircraft measurements. 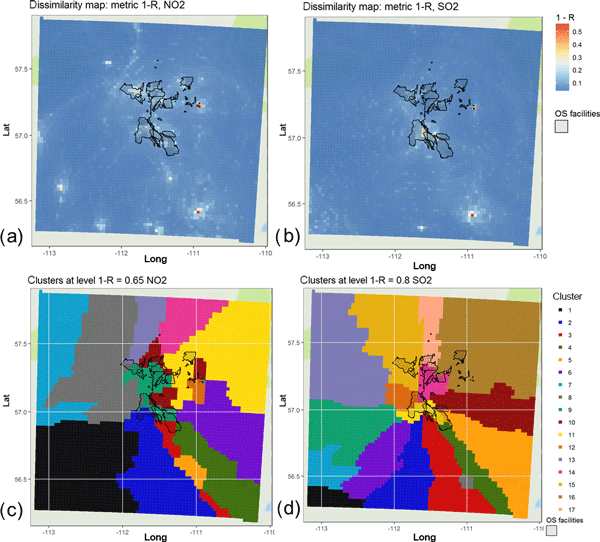 Novel facility-specific gridded spatial surrogate fields were generated to allocate emissions spatially within each huge mining facility. Complex computer model output was compared to and fused with observation data, to estimate potential damage due to acidifying precipitation for ecosystems in the Canadian provinces of Alberta and Saskatchewan. Estimated deposition was compared to the maximum no-damage ecosystem capacity for sulfur and/or nitrogen uptake; these critical loads were exceeded, for areas between 10 000 and 330 000 square kilometres, depending on ecosystem type: ecosystem damage will occur at 2013 emission levels. 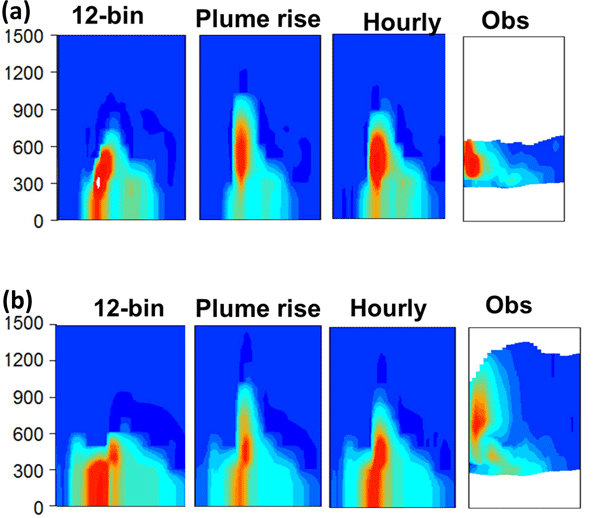 We examine the manner in which air-quality models simulate lofting of buoyant plumes of emissions from stacks (plume rise) and the impact of the level of detail in algorithms simulating particles' variation in size (particle size distribution). 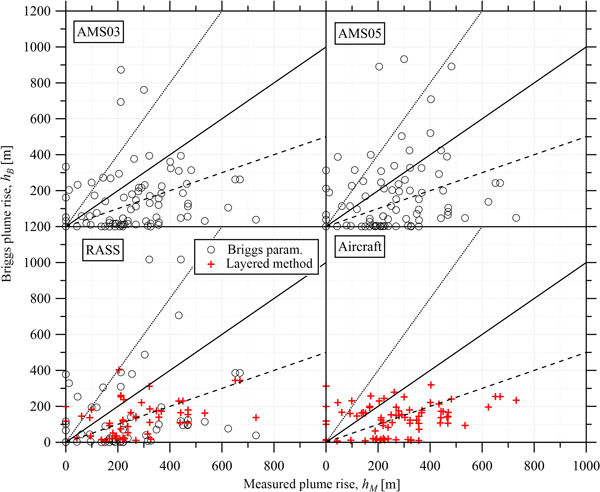 The most commonly used plume rise algorithm underestimates the height of plumes compared to observations, while a revised algorithm has much better performance. A 12-bin size distribution reduced the forecast 2-bin size distribution bias error by 32 %. How important is biomass burning in Canada to mercury contamination? 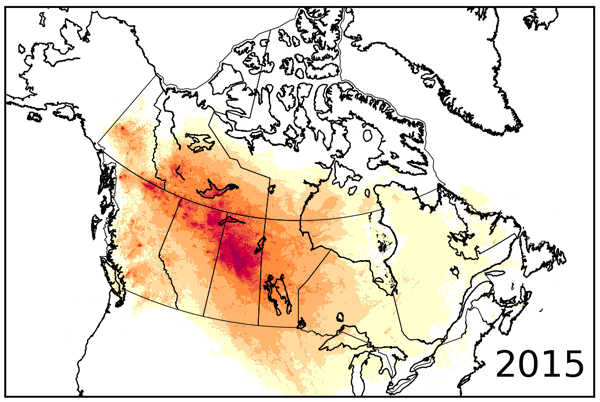 This paper quantifies the emissions of mercury from biomass burning in Canada. Using an emissions inventory of mercury in the GEM-MACH-Hg model, surface observations of mercury concentration, and a top-down inversion method, we generate optimized emissions of mercury. We find that biomass burning is an important source of mercury emissions and deposition in Canada. Significant uncertainty remains, due to uncertainty in the speciation of emitted mercury. Grouping data on the basis of (dis)similarity can be used to assess the efficacy of monitoring networks. 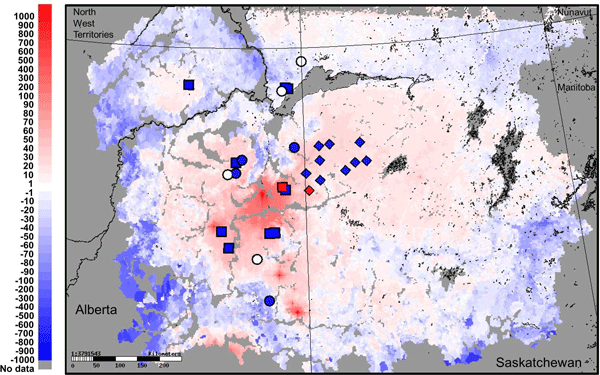 The data are cross-compared in terms of temporal variation and magnitude of concentrations, and sites are ranked according to their level of potential redundancy. The methodology can be applied to measurement data, helping to identify sites with different measuring technologies or data flaws, and to model output, generating maps of areas of spatial representativeness of a monitoring site. We developed emissions databases for polycyclic aromatic compounds (PACs) in the Athabasca oil sands region and evaluated the emissions databases by comparing CALPUFF-modelled concentrations with monitored data. Model–measurement agreement improved near oil sands mines due to updated PAC emissions from tailings ponds. 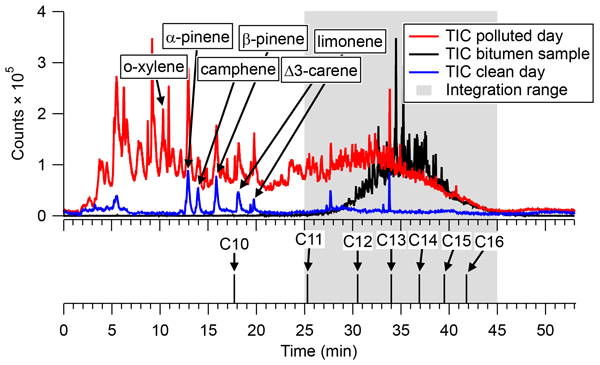 Modelled concentrations were underestimated at remote sites and for alkylated PACs suggesting that the emissions of PACs particularly alkylated compounds are underestimated. An aircraft campaign was conducted over the Athabasca oil sands (OS) region to characterize refractory black carbon (rBC) particles as they were emitted from the sources and as they were transported downwind; rBC size distributions were consistent at different downwind distances from the source area whereas coating thicknesses on the rBC cores increased considerably as the OS plumes were transported downwind. 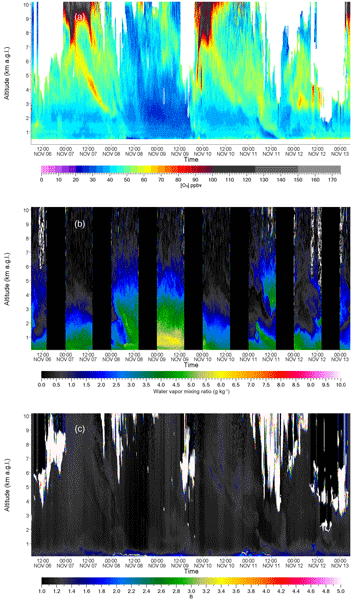 These results provide insights into the evolution of BC aerosol in the real atmosphere. Using a modified air quality forecasting model, we have found that a significant fraction (> 50 %) of ambient ammonia comes from re-emission from plants and soils in the broader Athabasca Oil Sands region and much of Alberta and Saskatchewan. We also found that about 20 % of ambient ammonia in Alberta and Saskatchewan came from forest fires in the summer of 2013. The addition of these two processes improved modelled ammonia, which was a motivating factor in undertaking this research. 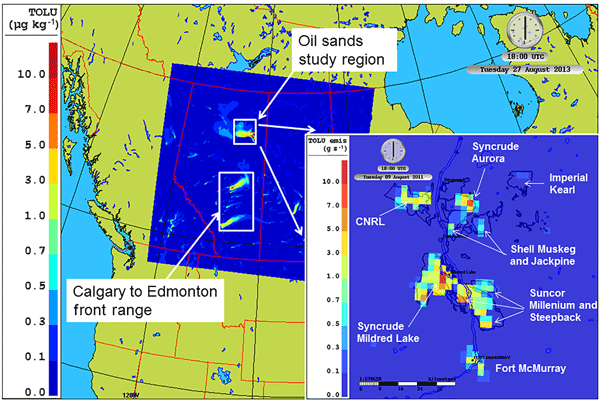 The sources of PM2.5 components exhibited short-term variabilities, and their contributions were identified in the Athabasca oil sands region. Much of the trace elements were found to originate from anthropogenic activities, i.e., oil sands upgrading and on- and off-road transportation. Some of these anthropogenic activities became better defined and understood only through highly time-resolved measurements, which can help guide further studies and policy decisions in the oil sands area. The emission and formation of gaseous organic acids from the oil sands industry in Canada is explored through aircraft measurements directly over and downwind wind of industrial facilities. Results demonstrated that the formation of organic acids through atmospheric chemical reactions dominated over the direct emissions from mining activities but could not be explicitly modeled. The results highlight the need for improved understanding of photochemical mechanisms leading to these species. Aircraft-based measurements of air pollutants from sources in the Canadian oil sands were made during a summer intensive field campaign in 2013. This paper describes a Top-down Emission Rate Retrieval Algorithm (TERRA) to determine facility emissions of pollutants, using SO2 and CH4 as examples. Uncertainty of the emission rates estimated with TERRA is estimated as 20%, which is primarily due to the unknown SO2 and CH4 mixing ratios near the surface below the lowest flight level.